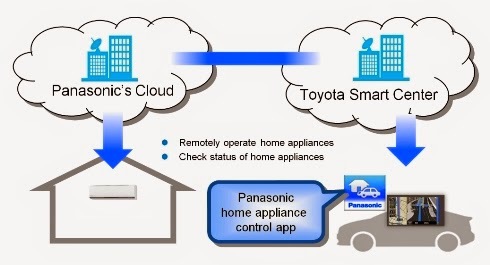 Toyota and Panasonic have developed a cloud based interface which will enable apps to be used to check in at home and operate a handful of appliances remotely as reported in The Toronto Star. This technology has been under process since a year. It will be available later this year. Toyota is expected to fully unveil the technology at the Smart Community Japan 2014 exhibition in Tokyo. In another source, Autonet which says“In theory, while you’re away from home you could record a favourite TV show, cook a meal in the microwave and time the air conditioning to cool the house to the ideal temperature upon your return. Nothing to do then but chow down in comfort in front of the TV (a Panasonic home theatre system, of course)."